Meet outside Kingsmeadow@MadeForever at 10:30 am on the first Wednesday of every month. We will be walking in the local area along the railway path. Come and join us for a lovely walk for the chance to get some fresh air, stretch your legs and meet new people. All ages welcome. 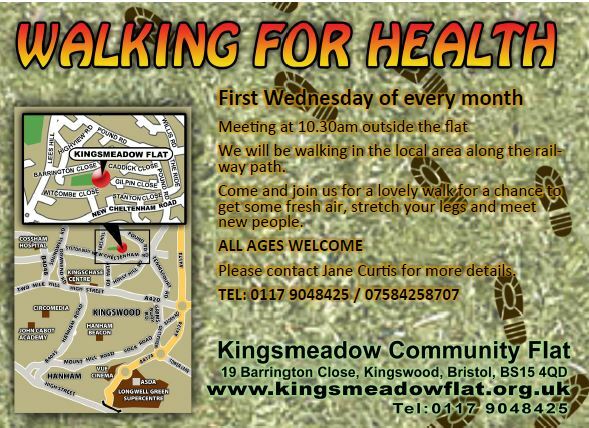 Please join us for weekly health walks of up to half an hour followed by a cup of tea and a chat. Walkers with or without walking aids are welcome. Please call Carly for details and a friendly chat – 01454 868744.